Cyclesnack: Tour de Mesh - Cancelled! At NEMBA's Fall Fiesta I rode with the Roth Brothers and their posse of Eastern Connecticut Mountain Bikers and we agreed on a date for another Fetish Fest, or shall I say ex-Fetish Cycles Owners Bike Fest. We did a similar event two years ago at Trumbull and then had dinner and brews at SBC on the Post Road. I was all set last night but the weather was looking kind of iffy at that point. Big rain storm headed our way. Bike was ready, Camel topped off, plenty of gu, cliff & powerbars, sport beans, camera, extra GPS and batteries, tools, first aid, and three tubes. Mounted a bottle cage on the 'Horse for extra water, too. 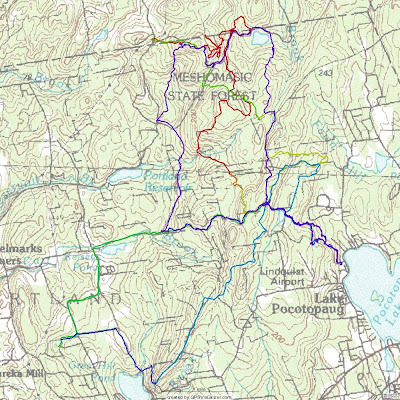 I even did some map reconnaissance last night by downloading a few GPX files from Crankfire and creating this map. Of course this map pales in comparison to the overall area that is covered by Meshomasic State Forest, 9,000 acres that spans from Portland to Glastonbury. We ended up doing an abbreviated 10-mile version including trail side cookout. Next year? We can surely schedule something sooner than that dirty dad. BTW, Nice GPS compilation. That includes several of our 'home grown' trails. I am bummed that this was a nogo. Once the weather broke, I got stuck doing other things, and then it was too late to ride because more rain came.